With interest rates at record lows, interest in precious metals continues to grow. Many investors are curious about the best way to access gold, with some preferring to use gold ETFs, whilst others prefer to buy direct physical metal (bars or coins) via a physical bullion dealer that is directly linked to a trusted gold refinery. We will deal with each of these factors in turn, using the example of typical SMSF trustee wanting to invest $110,000 (roughly two kilos of gold at todays prices and slightly above 10% of a typical SMSF portfolio) in the metals. We will also assume the return on gold is 9% per annum, roughly in line with the long run return for the yellow metal since the start of the 1970s. With physical gold, there are two fees that a SMSF trustee would pay. The first is the buy/ sell spread that a bullion dealer charges, whilst the second fee is the storage fee. Whilst there are many different physical bullion products that investors, including SMSF trustees, can choose from, the two products of choice for our client base are typically the ABC Bullion Pool allocated gold product, or the ABC 1kg Cast Bar Gold. 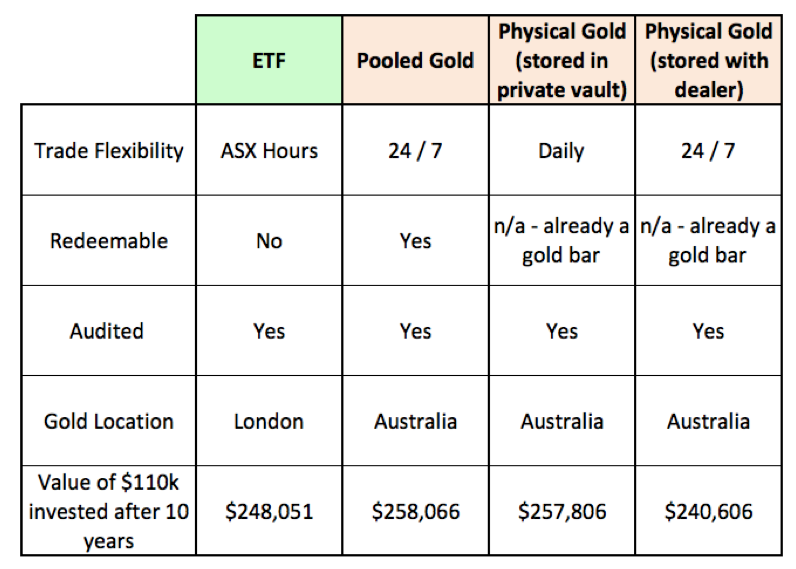 Pool allocated gold is in someway analogous to a gold ETF, in that you aren’t buying a gold bar you own directly, but rather an effective share in a pool of gold, which you have a claim on. In the table below, which shows the total invested and value after 10 years based on each of the investment options we’ve highlighted for buying gold, we have used an average MER of 0.50%, whilst the average slippage and brokerage fee were 0.21% and 0.10% per transaction. As you can see from the above, pooled gold would be the most profitable of all the options, as it has the lowest cost, followed by the physical gold that is privately vaulted. The ETF is only cheaper than one of the options an investor can choose from when dealing with a bullion dealer, rather than via their broker. Can be bought 24 hours a day either online or over the phone through a recognised bullion dealer. This twenty four flexibility is in line with the market for physical gold itself, which essentially trades around the clock (there is a one hour period when no major exchange is open), with much of the circa USD $100 billion in daily turnover occurring during European and North American trading hours. Provided you are buying through a LBMA accredited refiner and bullion dealer, then an investor can be very confident of trading substantial volume around the clock, as the requirements for LBMA accreditation mean that the refinery and bullion dealer must be doing turnover of several hundred million dealers a year at a minimum. Can typically only be bought and sold through the stock exchange, in hours when the stock exchange itself is open, which is typically just six hours a day in Australia. Whilst ETF’s have market makers that provide liquidity, exchange based turnover can often be quite limited, with some ETF’s having daily turnover of less than $500,000. Going to a bullion dealer direct is as easy as having to go via an ETF market maker. A physical gold bar or coin bought through a reputable bullion dealer belongs to the end investor. You don’t own a claim on gold, you own the actual product. Reputable bullion dealers will also typically provide full metal replacement insurance through Lloyds of London. The gold is stored in non-bank, special purpose bullion vaults that are located in Australia, which the investor has access too, and is regularly audited. Gold ETFs will typically have a claim on gold stored in bank vaults, which are usually located in London. The gold is audited, however, as per the Product Disclosure Statements that accompany many of these ETFs, a portion of the gold can be held in unallocated accounts, which is an unsecured credit risk. ETF product issuers also do not provide a guarantee that the gold custodian maintains adequate insurances for the gold held on behalf of the ETFs investors. If a trustee chooses to invest in physical bullion bars, then those bars are physically allocated to them, and can be delivered to the investor at any time if they so desire. If they buy pool allocated bullion, they can choose to take delivery of actual physical metal any time they choose, with a small fabrication fee charged. Typically, gold ETFs can’t be redeemed for real physical gold by the end investor. Some ETFs do allow for physical redemption, but usually only for ‘authorised dealers’, and even then, only if the redemption is in 400 ounce gold bars in London. In practical terms, for the average Australian investor like a SMSF trustee, physical delivery is not possible. The following table summarises the trade flexibility, costs, and redeemability of the most commonly used options for investing in gold. As should be clear from this illustration, there are significant advantages that come with investing in bullion through a recognised dealer. Not only is it cheaper in the long run (if bought in pooled form or stored privately), but it is also significantly more flexible from a trade perspective. It also goes without saying that owning your own gold privately vaulted in Australia is the most secure form of gold ownership one could hope for, and one that no existing financial product comes close to replicating. Whilst I’m firm in my belief that physical gold bullion is a superior investment choice for those wanting precious metal exposure in their portfolio, I do not wish to be misconstrued as being anti-ETFs in general, or gold ETFs specifically. Indeed, when it comes to gold ETFs, they remain the only way of getting any gold exposure within superannuation for the vast majority of Australians who have their money invested in retail and industry funds. More broadly speaking, I am supportive of the ETF industry as a whole, and acknowledge they have helped all Australian investors access investment opportunities and asset classes that were previously closed to them, or prohibitively expensive to enter. They are also helping bring down costs in more traditional asset classes, and putting pressure on active managers to deliver returns, something all investors benefit from. I own gold stocks in my own portfolio, as they offer great return potential, but it must be acknowledged that they are an entirely different investment proposition to physical gold itself. They are riskier not only from a volatility perspective, but an operational and credit perspective too. They are also not a homogenous asset class like physical gold is. For that reason, whilst physical gold is a monetary defensive asset (zero credit risk, uncorrelated to risk assets and highly liquid), the gold miners themselves definitely belong in the risk component of an investors’ portfolio.